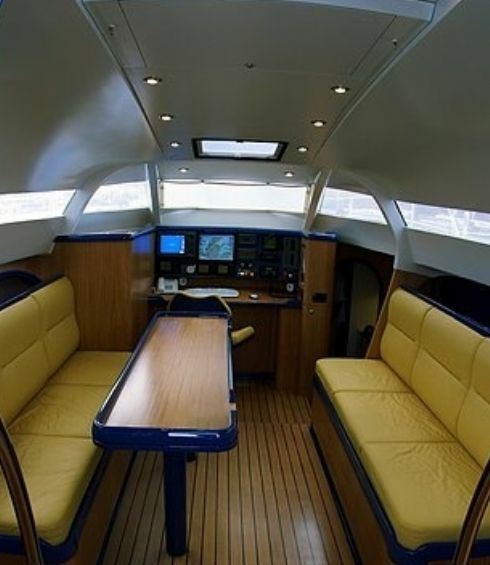 This futuristic sailing machine was designed for an experienced sailor whose remit was for a fast long distance custom blue water luxury cruising yacht. In particular the vessel has to be capable of being sailed by a small crew, and occasionally single-handed. In styling the boat the client particularly wanted to maintain some consistency with the form of an open 60, whilst improving comfort and protection from wind and weather. Lead designer Allen Clarke had the delicate job of balancing the requirements of comfortable sea keeping, comfort and a luxurious accommodation with the ever-present greed for speed. The saloon area inside the coach roof seats eight for dinner with exterior views and the main accommodation is divided into two comfortable staterooms aft and four other berths. At the owner’s request the area forward of the mast is left empty, as the intention is to cruise quickly and with the minimum of people whilst still having the ability to lavishly entertain in harbour. Stability and righting moment is high and commensurate with a transoceanic yacht designed to round Cape Horn, as the owner has already done before. In more exotic locations, access into shallow anchorages is achieved by means of a lifting fin and bulb keel. Once at anchor the transom converts into a bathing platform from where the fully inflated tender can be launched from its garage with access in/out of the water via a slide away boarding ladder under the starboard steps. For Mediterranean style mooring the lightweight carbon passarelle/ gangway is discretely disguised as the top cross member and guardrail on the yacht’s stern. As with open 60 race boats, the design is geared towards performance for fast passage making. Our single-handed race design pedigree ensures that this yacht is at the same time easy to handle, stable and safe to sail for prolonged periods under autopilot in any conditions. Features include a canting keel, full roach mainsail and furling headsails. In keeping with the design remit of simplicity, there are limited electric and hydraulic systems for sail and winch handling, backed up by a powerful pedestal grinder mechanism. However, where the owner felt necessary, systems are in place for ease of use whilst cruising, such as a boom furling mainsail and hydraulic retractable bow thruster. Due to the complex engineering of modern yacht structures, extensive use has been made of advanced analysis techniques, such as finite element analysis, to ensure the optimum use of materials. This has enabled us to produce a lightweight boat and interior for high performance cruising without compromising safety. On the first cruise with the owner, one aspect of the boat that became immediately apparent to us was that as a result of the canted keel, the yacht can be sailed at low angles of heel and hence great comfort. There is a far lower drop off in performance than a conventional yacht when sailing in this mode. Moving around the boat, cooking in the galley and the usual chore of a trip to the heads whilst beating to windward towards Great Barrier Island at the edge of the Hauraki Gulf seemed to require less than normal effort. Spirit of Adventure was the second Owen Clarke Design yacht to be designed predominantly in 3D. Liz Tier, our young, new naval architect, was charged with this work, and Tim Sadler, our engineer, was responsible for the complete and detailed design of the yacht’s systems, keel and hydraulic mechanisms, retracting bowsprit etc. Allen Clarke carried out the interior styling and design to the client’s wife’s very particular specification. Needless to say she is delighted with the result. As well as being the yacht’s designers, Owen Clarke Design were contracted to provide a project management package in the same way as we did for the Kingfisher and the more recent Ecover project. The brief was to oversee the construction of the yacht from conception to turn-key delivery. In November 2004 the luxury cruiser Spirit of Adventure returned from Tahiti to the viaduct basin in Auckland where she was launched. Here is unedited our client’s report after that trip and of the period when he had been cruising with his family in the Pacific. In exact 12 days we sailed 2483 m ( may be more, because I calculated it only in the charts day by day). We have had wind till 45 kn and the ship was sailing very safe with the solent and 2 reefs in the main on an angle to the wind of 120 till 140 degrees. In this strong wind we have got a speed of around 16 kn in the top. The ship was always easy to control and to handle. Only the main was damaged in the area of the battons. But I think Tim gave you already this information. The main is now in the loft of Northsails and Bikky promised to repair it in a stronger kind. When you are interest to see my movie about this trip, I'll send you the DVD when we back in Germany end of the next week. In the meantime the yard is working to improve and to repare the points on my list. All is running well. The ship should now stay in NZ till April 2005. Than I´ll start to an other trip. But the destination is not quite fixed. About this I have to talk with Elke. I am also happy to got the info that you and your team have got some further orders to construct nice boats.